KONG Quest Forages are fun fillable toys for your dog. You can fill these toys with tasty snacks, so your dog will not be able to resist them. Thanks to the special texture of the grip, these toys make unexpected movements. This makes them a fun challenge for your dog! 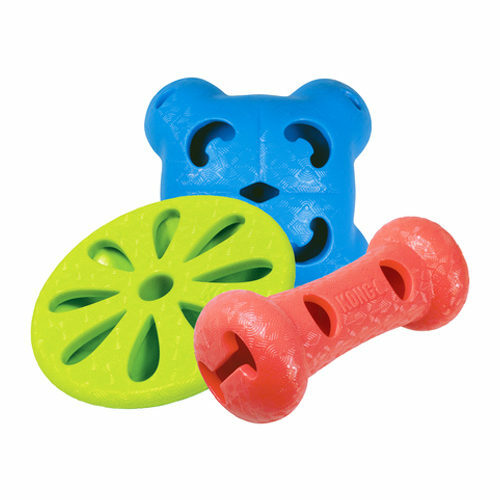 Your dog will have lots of fun with the KONG Quest Forages. These dog toys can be filled with delicious snacks. Because the toy makes unpredictable movements, it will be a challenge for your dog to get to the treats. The toy has various individual treat compartments, so you can hide several treats in it. KONG has many more fun toys for your dog. View the entire KONG range here! Have you used KONG Quest Forages before? Let us know what you think about this product.